Hi friend! I hope you’ve been having a beautiful week. With summer now in full swing I want to share a new recipe I’ve created the combines the fresh tartness of lemons with the rich crush of a walnut shortbread crust. This recipe is really simple to make and only requires about 10 minutes of prep. Once it’s assembled all you have to do it let it set and enjoy! This gluten-free walnut short bread crust is packed with fibre, healthy fats, and protein to ensure that even when indulging in sweet treats your blood sugar stays stable to prevent inflammation and illness. You could even use this recipe to make little cookies if you’d like, though you may want to play around with a bit more palm sugar if that is the case. The filling of this tart is made from a base of coconut milk, which provides some natural sweetness, lemon for the tangy zing, and grass fed gelatin to create the fabulous texture. Gelatin is made from the cartilage and joints of animals, typically cows, and provides amazing health benefits in terms of healing the gut, joints, and increasing skin elasticity. You can read a bit more about it here. I like to use gelatin as a functional food to help keep my gut healthy and happy and my skin strong and firm. What better way to incorporate it into your diet than by adding it to your new favourite dessert? If you’re living a plant-based lifestyle you can use agar agar (a type of algae) to thicken the filling instead. Enjoy! Combine all remaining crust ingredients in a medium sized mixing bowl until a slightly crumbly texture is achieved. Firmly press into the bottom of the cheesecake pan. Place in oven and bake for 10 minutes until golden brown. As the crust is cooking heat the coconut milk, honey, and vanilla in a saucepan over low heat, being careful not to bring it to a simmer or boil, whisking constantly. If it starts to steam remove from heat. Once heated whisk in gelatin until smooth and a spoon dipped into the mixture does not have any small grains stuck to it. Then whisk in turmeric powder, lemon zest, and lemon juice. Once crust is cooked remove from the oven and allow to cool for 5 minutes before pouring custard mixture on top. Place in the freezer to set for one hour. *If you have agar agar flakes, grind them down first. Generally 1 tsp. powder = 1 tbsp. flakes. 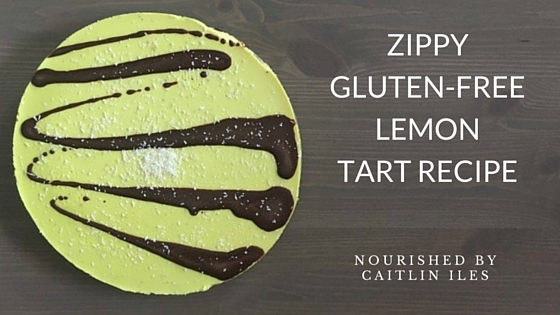 Well friend, that’s our delightfully decadent, oh so healing gluten-free lemon tart recipe for today. I hope you enjoy it!